If your property has soft, sandy soil or loose gravel on top of a shallow water table, there are three cost-effective methods of drilling your own backyard water well; however, this water is only suitable for lawn sprinklers and gardening. On the other hand, if the water table is 150 to 300 feet below the surface, use a portable drilling rig, or hire a contractor for the project. Deep well water is usually potable -- provided it passes certain tests performed by an approved laboratory. If not, your deep well should produce enough water for a sophisticated irrigation system. Check your local suburban zoning laws before planning a well or purchasing equipment -- some cities to not allow private water wells. On the other hand, if your local ordinance allows backyard wells, apply for the relevant permits and ask for the location of municipal utility cables and pipes on your property before proceeding. Once this is done, establish the approximate depth to water table by either checking the depth of nearby wells or hiring a hydrologist to run a survey of your immediate area. A wellpoint is a perforated pipe fitted with a hardened point that is driven into the ground by hand. The openings in the pipe are large enough to allow water to enter but small enough to keep water-bearing gravel out of the pipe. Wellpoints vary in diameter from 1 1/4 to 2 inches, with lengths between 18 and 60 inches. After the initial drive point is hammered into the ground, subsequent pipes are attached to the ends with specially designed drive point couplings. Pipes are added until the perforated end penetrates the water table by 2 to 6 feet. Wellpoint extraction only works when driven into a high water table, 10 to 15 feet below the ground. Once installed, about 5 or 6 gallons per minute can be pumped out using a pitcher pump or a shallow well pump. 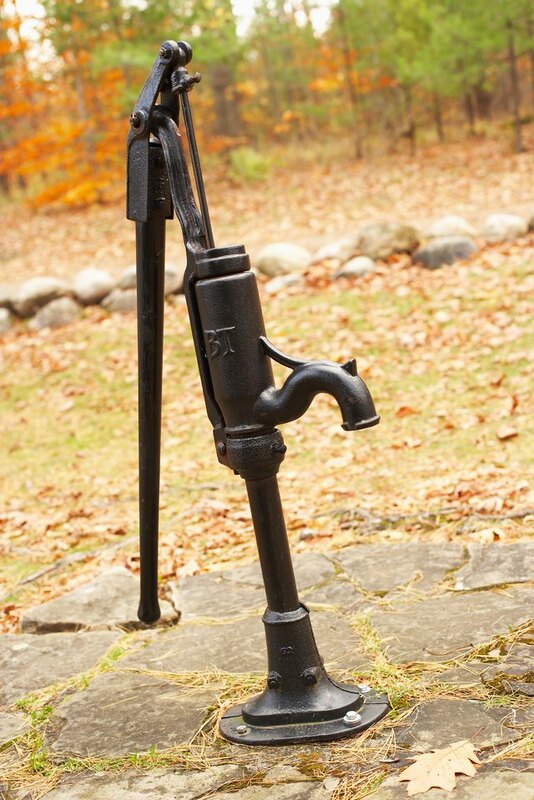 An air pump-assisted drill bit can drill your backyard water well to a depth of up to 100 feet. The unit consists of a small but powerful air-driven drill bit capable of cutting through hardened clay and densely packed soil. The bit is attached to the end of a tubular expansion chamber containing the inlet pipe from the air pump, with holes in the lower part for water to flow into the system. A 100-foot length of 2-inch PVC pipe is attached to the outlet port of the expansion chamber. The well is constantly filled with water from a garden hose until the drill bit penetrates the water table. Exhaust air from the drill bit is ejected up the expansion chamber and into the 2-inch PVC pipe, forming a vacuum and sucking water and slurry out during drilling operation. A well liner, foot strainer and pump is installed on a concrete slab to complete the project. Jetting or washboring is suitable for producing a shallow well where the distance to the water table is 25 feet or less. In basic terms, serrated teeth are cut into the end of a schedule 40 PVC pipe with a hacksaw. A drill head with two 3/4-inch threaded fittings is attached to the top of the pipe with a threaded pipe coupling. Hose pipes are connected to the threaded fittings to supply a constant flow of water into the Schedule 40 pipe. A wide wooden handle is attached to the pipe with hose clamps to provide leverage. The operator stands on an open pickup truck tailgate, places the serrated end of the pipe on the ground and has a helper turn on the hose pipes. He then twists wooden handle back and forth to allow the teeth on the end of the pipe to cut into the soil with the help of jetting water. Extra lengths of pipe are added until the required depth is reached. A well liner, foot strainer and pitcher pump or a shallow well pump is installed on a concrete slab to complete the project. Use a one-man diesel-powered micro drill rig to drill a well up to 300 feet through clay and rock formations. These rigs are equipped with hydraulic power for easy handling and for added pressure on the drill bit. A powerful mud pump is used to pump drilling mud directly to the drill bit to speed up drilling action, and manual setup and positioning is straightforward. Since these micro-rigs cost over $20,000, you may be able to rent one through a heavy equipment rental outlet. If not, you could always recover costs over time by renting the machine out to your neighbors -- or you could establish your own micro-drilling company as an added source of income.